Reader John Fischer wanted high country. He got high country. This is John at Engineer Pass. John Fischer got in touch with me a few months back. He’s an avid reader of this blog and hoped we’d be able to ride together while he was out here for vacation. We did just that! John hails from Michigan and asked for alpine views, so we met at the Ridgway Shell station at 8 am. From there we went over Last Dollar Road, Ophir Pass, San Juan CR 14, through the Red Mountain Mining District on Ouray CR 31, then up over Corkscrew Pass, Hurricane Pass, California Pass, with a side trip up Placer and Picayne Gulches, past Animas Forks, up to Engineer Pass, and then down Ouray CR 18 to US Hwy 550. I can report that John is an outstanding dirt biker and I think he had a very good time—I certainly did! We had an early dinner in Ouray and then bid farewell. I look forward to riding with John again. The GPS track is at the bottom of this post. 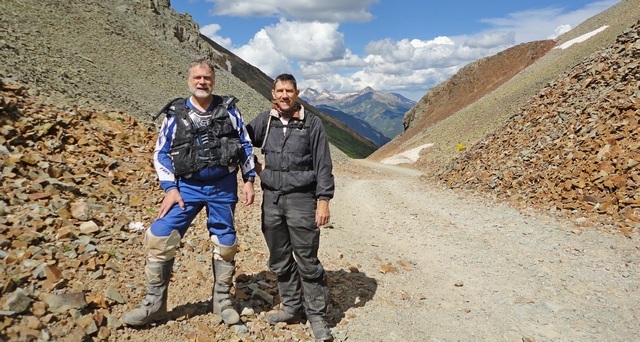 John (r) and Dave at Ophir Pass looking to the west. Quite a loop for one day! You can't do this in a Jeep in one day, that's for sure. 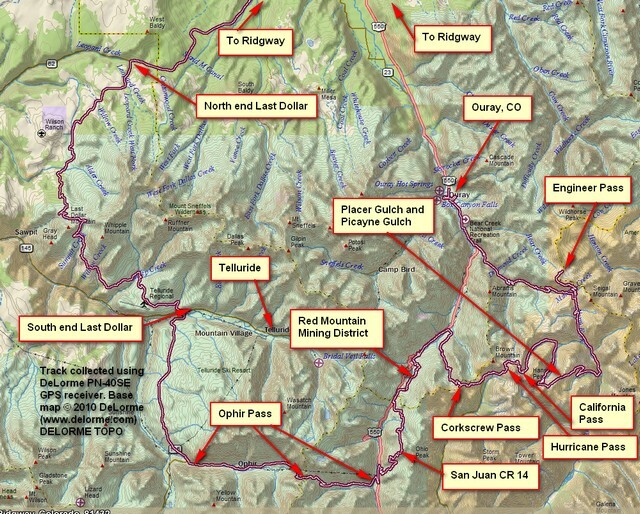 This entry was posted in GPS Tracks, Motorcycling, Ouray County, San Juan County, San Miguel County and tagged california pass, Corkscrew Pass, Engineer Pass, hurricane pass, last dollar road, ophir pass, Red Mountain Mining District. Bookmark the permalink. Man John, that sounds like one heck of a ride. Very nice of Dave to show you some great DualSporting in his area. Lets pay back the favor the next time he comes to Michigan. Corkscrew, CR14, and Eng Pass stand out as switch back after switch back going up up up. I gulped on several of the turns but my DRz400 never even hick-up’d. I ended up with 150 miles over 8.5 hrs not including dinner stop in Ouray. I am no longer afraid of heights.